Install the Screamin’ Demon Coil on your PT Cruiser or Mini Cooper and open up the spark plug gaps to a massive .065″! The larger gap and longer duration spark provides a more complete burn of the fuel mixture over the stock coil. You’ll notice a smoother idle, more power and no drop off in performance as you accelerate. The hotter spark will also help keep spark plugs cleaner. The Screamin’ Demon Coil mounts in the original factory location with no modifications. 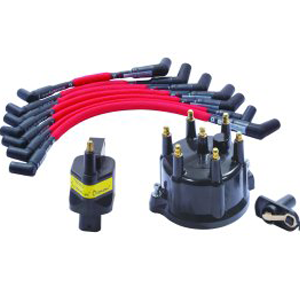 Delivering a high voltage spark to the plug requires a quality spark plug wire. Our LiveWires are unsurpassed in quality by offering low resistance and high temperature protection. The 8 mm wire is covered by a heat treated fiberglass sleeve that protects the wire up to 1400° F. The spiral wound core is radio suppression so there is no computer interference or radio noise. 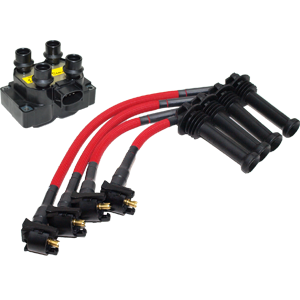 Unlike universal plug wire sets, LiveWires do not require any assembly. All sets are custom fit and numbered at each end for the correct cylinder. Available in red, black, blue, purple, yellow and silver, the LiveWires give your PT or Mini the best plug wire technology along with a high performance look.